Purpose When it is possible that the employee’s work ability can be restored through treatment or rehabilitation, disability pension in Finland is granted for a fixed period. We examined which factors are associated with return to work (RTW) after such temporary disability pension. Methods The study included all Finnish residents whose temporary disability pension from the earnings-related pension system started in 2008 (N = 10,269). Competing risks regression analysis was applied to examine register-based determinants for RTW after temporary disability pension due to mental disorders, musculoskeletal diseases, other diseases, and injury over a 4-year follow-up period. Results The overall cumulative incidence of RTW was 25 %. RTW was more probable after temporary disability pension due to injury and musculoskeletal diseases and less probable after temporary disability pension due to mental disorders. Younger age and higher education increased RTW but differences between genders, private and public sector employees, and occupational classes were relatively small. The probability of RTW was higher among those who were employed before their temporary disability pension (subhazard ratio in multivariate analysis 2.41 (95 % CI 2.13–2.72) and among the 9 % who participated in vocational rehabilitation during their pension [SHR 2.10 (95 % CI 1.90–2.31)]. With some exceptions, the results were fairly similar for all diagnostic causes of temporary disability pension. Conclusion Return to work after temporary disability pension was relatively uncommon. Nevertheless, in all diagnostic groups RTW continued for the whole follow-up period. The low educated and those not employed before temporary disability pension need more support in their RTW. 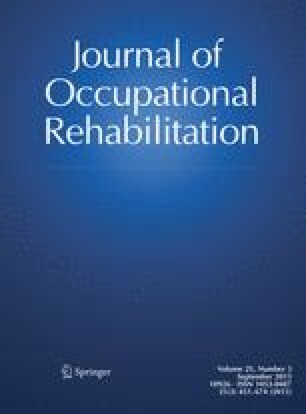 The strong association between vocational rehabilitation and RTW suggests that increasing rehabilitation among those with impaired work ability may promote RTW. The dataset consists of register data which were anonymized and not possible to trace back to individuals. The Finnish Centre for Pensions obeys the ethical standards of The Finnish Advisory Board on Research Integrity and monitors that responsible scientific practice is followed in collecting, analysing and reporting of data.